Today the members of AAII responded to their weekly sentiment survey with a very lopsided expectation for the next 6 months: 58% bears, 24% bulls and the rest neutral. Interestingly enough, this level of bearishness was registered after the strong close on Wednesday. So maybe people are wising up to these one day spikes, or else, they are truly very pessimistic. In mid February of 2003, we saw a reading of almost 58% bears but it wasn’t until later in March that a definitive bottom was put in and a new cyclical bull born. The March 2003 bottom was put in with a 51.4% bear reading and the bull ratio was at 0.40 - higher than it is now. 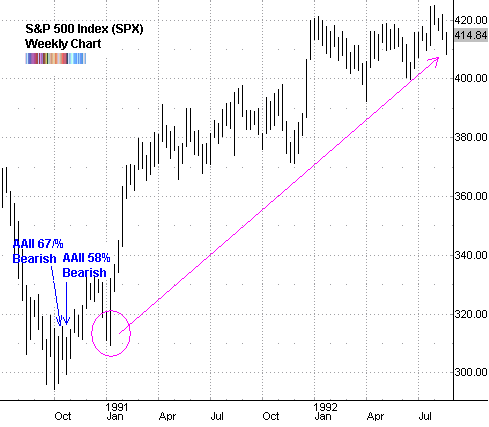 Unlike the 2003 scenario, from August 1990 to the end of October 1990, there was an almost uninterrupted string of bearish readings above 50%. But similar to 2003, there was a dip back to retest the bottom (purple circle) in early 1991 and then the market zoomed ahead. What was the highest levels of bearish sentiment recorded during the bear market of the Nasdaq? Did it only reach extreme levels when it turned? I’ll look it up and let you know. Also, I would be interested in your opinion. 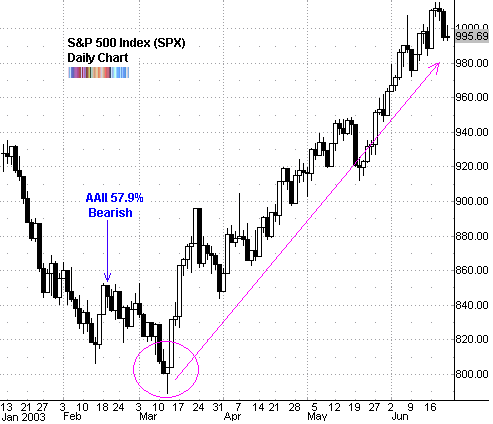 Do you think the higher levels of bearish sentiment are more important in a bull market? If the overall market has turned bearish, would they have as much impact?